I’ll go ahead and answer all of your questions now. Yes, this cake was amazing. Yes, it was devoured in about three seconds flat. Yes, I believe that a lot of baked goods might benefit from a small hit of Amish Friendship Bread starter love. This one certainly did. 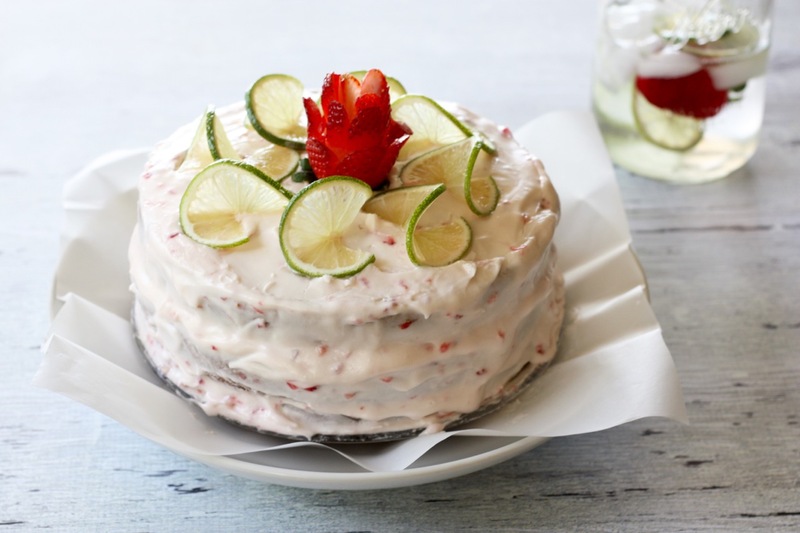 This Strawberry Limeade Amish Friendship Bread Cake, adapted from a recipe in Country Living, is the perfect springtime dessert. Airy and flavorful, it’s a promise of what’s to come as the winter months warm up. The only bummer, if you could even call it that, is that this isn’t a one-bowl recipe. 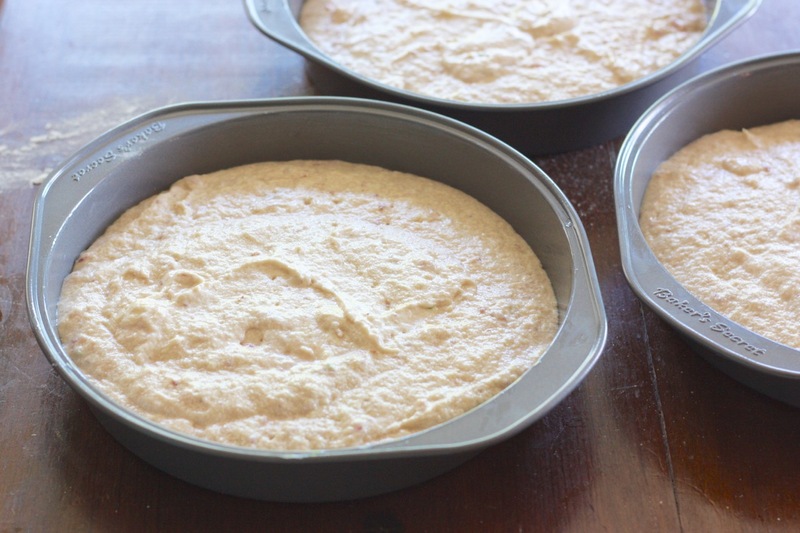 There are a few extra steps (and extra mixing bowls) that make this recipe a little more work than we’re used to with Amish Friendship Bread, but it was worth it. 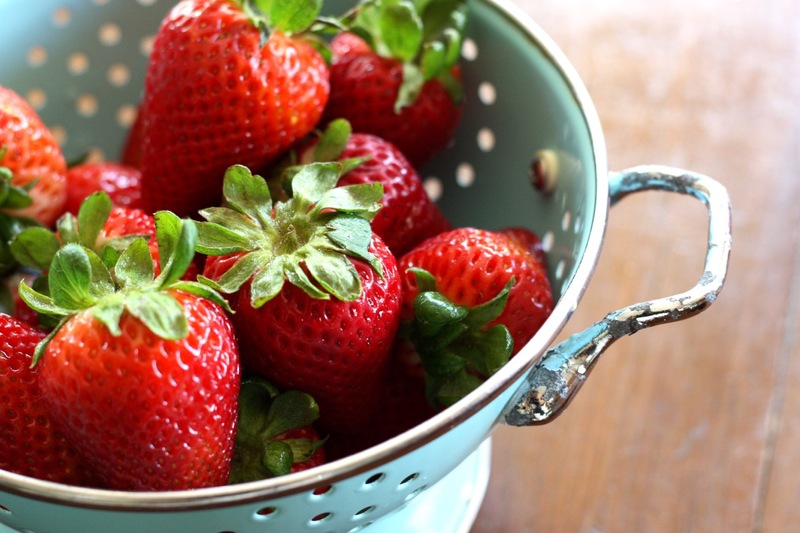 You’ll start, of course, with fresh strawberries if you can get them. 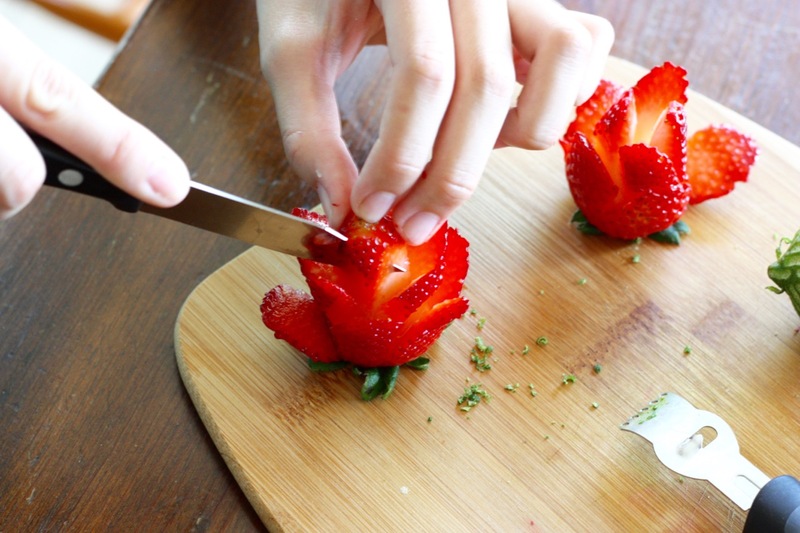 If not, thawed frozen strawberries (drained) work just as well. Run it through your food processor (I use and love a Zyliss manual one) to make a puree with a few small chunks here and there. I bought three limes for the zest and juice. If you’re a fan of citrus, I’d add a fourth. 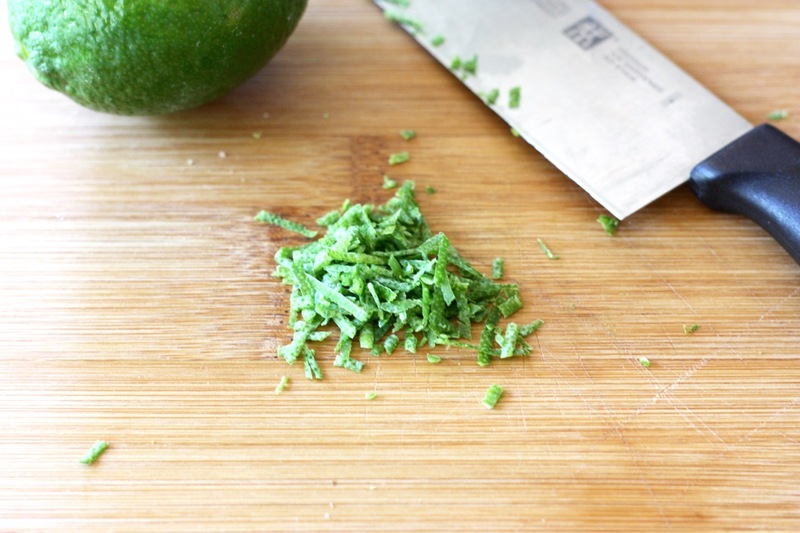 It’s also good to have a spare lime on hand for garnish. 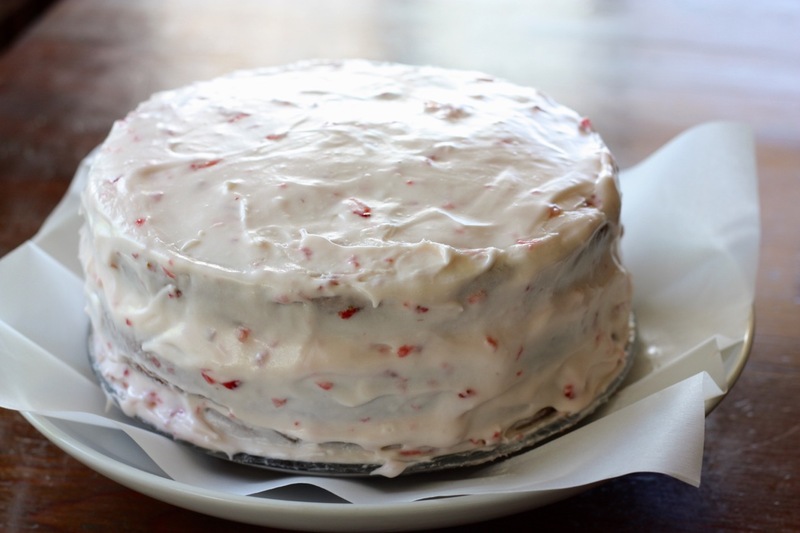 This recipe uses three 8″ cake pans to make a simple layer cake. Kitchen Tip! 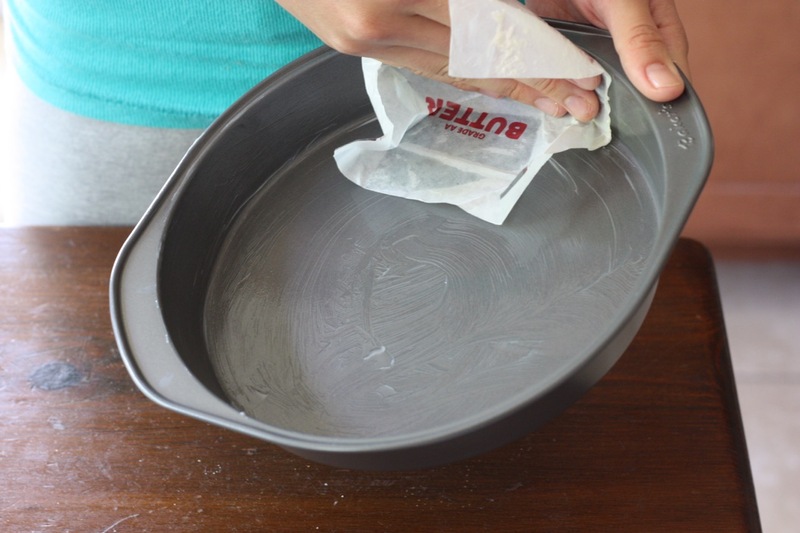 Don’t throw your butter wrappers away — save them to grease your cake tins. One wrapper can easily cover one tin and more. 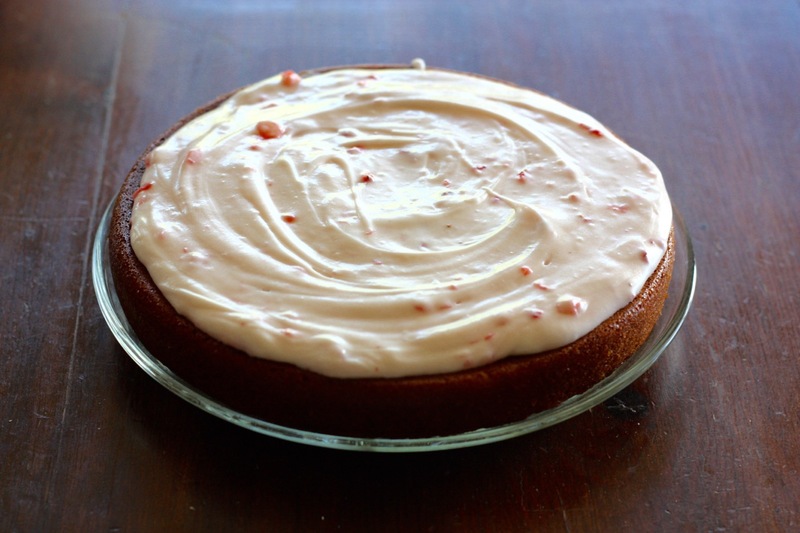 The recipe calls for cake flour, which yields a finer, lighter crumb. If you don’t have any on hand, all-purpose flour is fine or you can make a simple cake flour substitute by replacing four tablespoons of the all-purpose flour with four tablespoons of cornstarch. 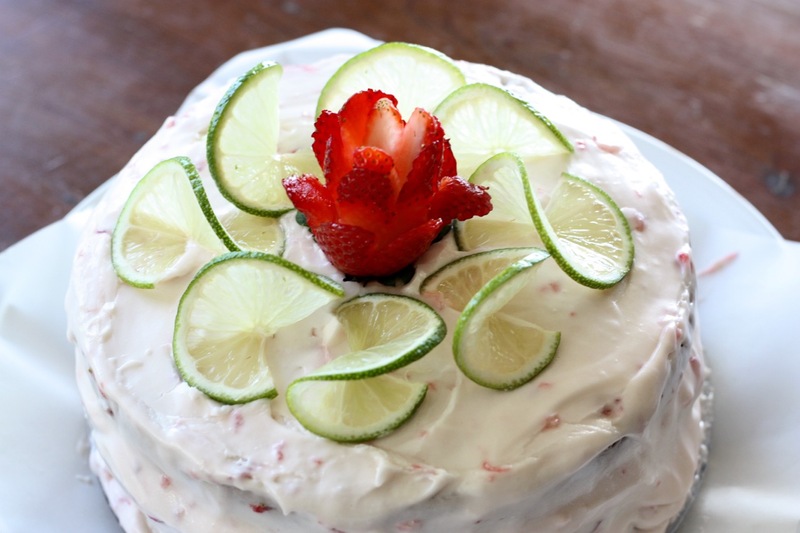 I made a Strawberry Lime Cream Cheese Frosting. I frosted each layer individually and then placed them on top of each other. If your kitchen is warm or your frosting is a bit runny, you’ll want to let the frosted cakes set up individually in the fridge first. Stack the cakes on top of each other and then let the entire cake set up in the fridge. If your layers feel loose, fold a long strip of plastic wrap in half lengthwise and wrap it around the cake before placing it in the fridge. I had been thinking about just frosting in between the layers but my kitchen was warm so I ended up frosting the whole thing. 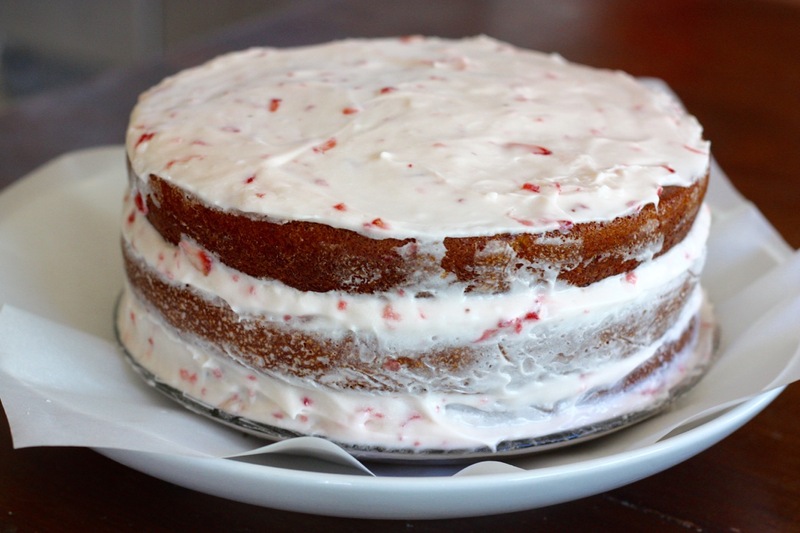 Once the frosting had set, it was time to add a little garnish. 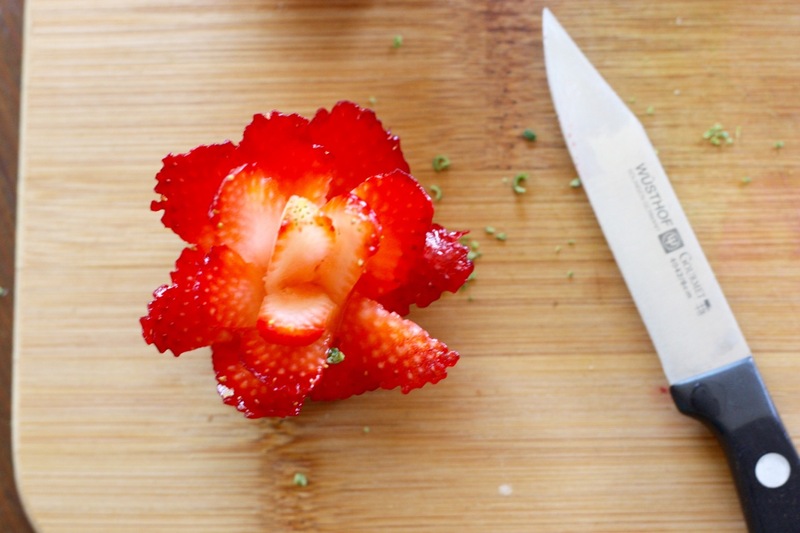 A good paring knife makes it easy to transform a whole strawberry into a flower bloom. Start at the bottom making downward notches, getting smaller (and narrower) as you get to the top. Leave the green tops on! I sliced up one of the limes on my Oxo mandoline and then used the paring knife to cut from the center to the rind to one side. Then give the slice a little twist. I loved the way everything turned out and while pretty is nice, this cake tasted amazing with just the right amount of Amish Friendship Bread tang. 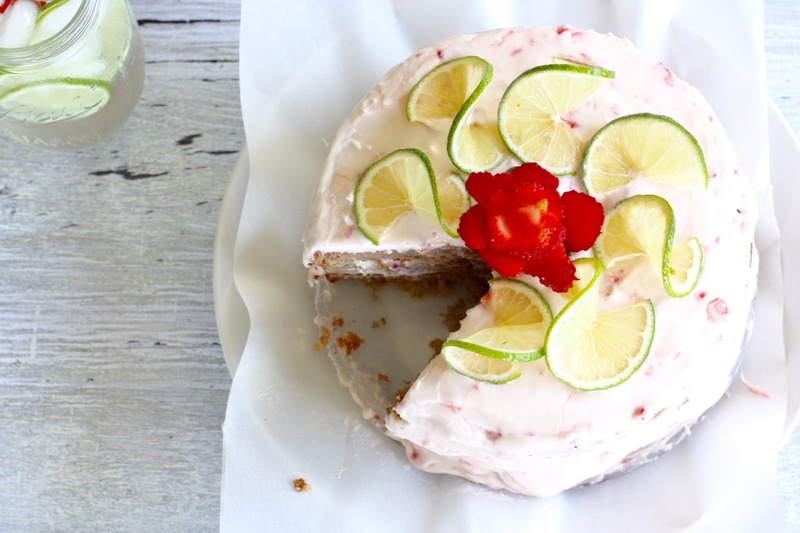 Airy and light, this Strawberry Limeade Amish Friendship Bread Cake is the perfect dessert to herald in spring. Grease three 8-inch round cake tins. Whisk flour, baking soda, baking powder, salt and pudding mix in a mixing bowl. 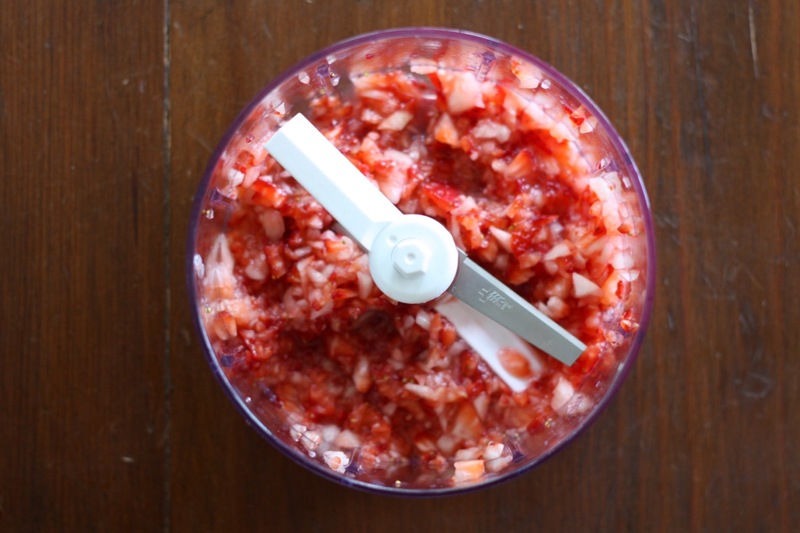 Puree strawberries in a food processor, leaving a few small chunks. Whisk starter, buttermilk, and 1 cup of the puree in another bowl. Reserve any excess puree for frosting. In a large bowl, beat butter and sugar with an electric mixer on medium speed until light and fluffy. Add the eggs one at a time, making sure that each one is fully incorporated before adding the next. Add vanilla and lime zest. Reduce speed to low and alternate adding the starter mixture and the flour mixture until flour is incorporated. 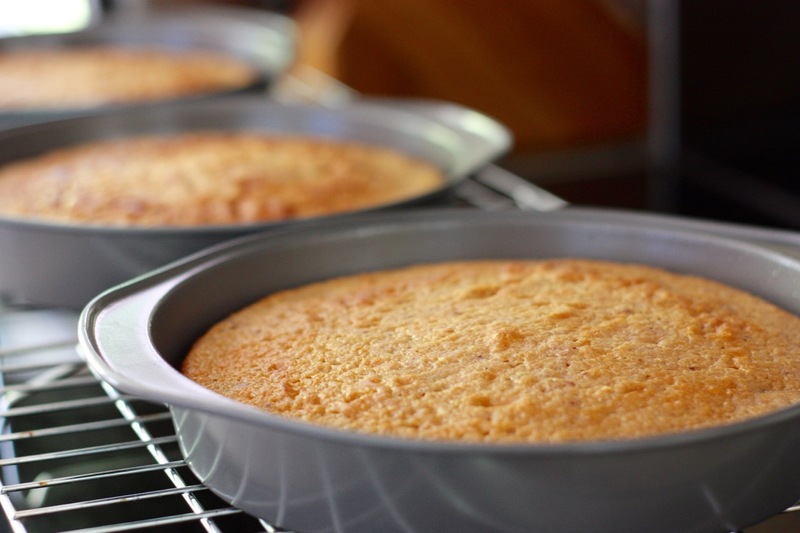 Divide batter into prepared cake tins. Bake for 35-40 minutes or until the bread loosens evenly from the sides and a toothpick inserted in the center of the bread comes out clean. Use the wrappers from the sticks of butter to grease the cake tins.